In this latest video, Anthony Morris III is not really talking about obedience to Jehovah, but rather, obedience to the Governing Body. He claims that if we obey the Governing Body, Jehovah will bless us. That means that Jehovah approves of the decisions coming down from the Governing Body, because Jehovah would never bless wrongdoing. Is this truly the case? Second, this command was only given to Peter. At one time, we believed that there was a first-century faithful and discreet slave, so an argument used to be made for a succession of the authority-to-feed from the first-century faithful slave extending down to the present day. However, we no longer believe that. We’ve recently received “new light” that there was no first century faithful and discreet slave, so Jesus’ words to Peter cannot relate to the Governing Body if we stick with JW doctrine. The feeding Jesus commanded Simon Peter to perform had nothing to do with being the faithful and discreet slave—again, if we are to accept the new light from the Governing Body as truth. Before we get into the talk, we should be mindful that often a speaker reveals much about his intentions by what he doesn’t say, or by what he omits. In this talk dealing with obedience, repeated reference is made to Jehovah and even more reference is made to the Governing Body; but there is no reference made to the Lord and Master and King to whom all obedience is due, Jesus Christ. No mention at all! (Heb 1:6; 5:8; Ro 16:18, 19, 26, 27; 2 Co 10:5) Jesus is the Greater Moses. (Acts 3:19-23) By repeatedly excluding the Greater Moses from discussions where he belongs, is someone fulfilling the role of the Greater Korah? The directive coming from the apostles and older men of Jerusalem was arrived at by holy spirit. (Acts 15:28) Thus, it was from God. However, our Governing Body admits that they are fallible and that they can (and have) made mistakes. [i] History proves that they have erred on numerous occasions in their direction. Can we honestly say that these mistakes came about because Jehovah was guiding them? If not, then why should we obey them unconditionally expecting Jehovah to bless us for it, unless there were some way to know that we were obeying God and not men? We’re not guilty of dogma! “If you refer to a belief or a system of beliefs as a dogma, you disapprove of it because people are expected to accept that it is true without questioning it. A dogmatic view is obviously undesirable, and one other dictionary says, ‘If you say someone is dogmatic, you are critical of them because they are convinced they are right and refuse to consider that other opinions might also be justified.’ Well, I don’t think we would want to apply this to decisions that come out from the faithful slave in our time. Fascinating! He provides us with an accurate definition of what it means to be dogmatic, yet claims that this definition does not describe the actions of the Governing Body as dogmatic. If this is true, then we are safe to conclude that the Governing Body does not expect us to accept its beliefs without question. Moreover, the Governing Body is not convinced it is right and does not refuse to consider that other opinions might be justified. If you believe that Anthony Morris III is telling the truth, if you believe he is not lying in this video, why not put it to the test. Go to your next meeting and tell the elders that you don’t believe in 1914, or that you don’t want to report your time anymore. A person who is not dogmatic will allow you to have your own opinions. A person who is not dogmatic will not punish you for having your own opinions or for doing things your own way. A person who is not dogmatic will not threaten you with a life-altering punishment like shunning if you choose to disagree with him. Go ahead. Try it. Make my day. Now we have apostates and opposers who would like God’s people to think that the faithful slave is dogmatic and they expect you to accept everything that comes out from headquarters as if it’s dogma, arbitrarily decided. Well, this does not apply and that’s why it’s properly translated decrees, and in our day, like brother Komers prayed and often the brothers do…about decisions that are being made not just by the Governing Body but branch committees…ah…this is a theocratic arrangement…Jehovah is blessing the faithful slave. At this point, he is starting to lose his way. He has no valid defense other then to make a pile of unfounded assertions and then try to discredit the opposition. The organization sure is talking about apostates a lot these days, isn’t it? It seems a talk hardly goes by where the epithet isn’t bandied about. And it’s such a convenient label. It’s like calling somebody a Nazi. If you don’t get it, ask Jehovah to help you understand? And how exactly does Jehovah “help you understand”? He doesn’t talk to you, does he? No voices in the night? No, Jehovah helps us by giving us his holy spirit and opening up Scripture to us. (John 16:12, 13) So if he does that and we see that some direction is wrong, then what? According to Morris, we’re supposed to obey the men of the Governing Body in any case. But make no mistake: They are not dogmatic! Well in the very verse being used in Acts 16:4 shows if there was a Governing Body it was made up of more than the Apostles, as the decrees that were decided upon by the apostles and elders in Jerusalem. Picture Jesus gathering his disciples around him everyday and asking them: “You guys still believe I’m the son of God right?” Or being concerned at all with what the Pharisees were saying about him. Precisely. The GB constantly hounds their adherents for loyalty and obedience because they themselves have no faith in their own validity. If they had confidence in themselves and their position, Geoffrey Jackson would not have told the ARC that it would be presumptuous to assume they were the sole channel from God. Funny thing is, he was right – it IS presumptuous. Too bad he later backtracked and denied this. But then, what choice does the GB have? If you are an accomplice to institutionalized lying, you have to keep telling the same lies consistently, otherwise it’s game over. Hi Robert , just love the way you put it. Isn’t it funny how it’s ok to tell “institutionalised” lies but not personal ones ? Strange what these men think . It’s as if the institution can do no wrong , even if it is doing wrong? How did I ever accept this ? I always wondered to about Tony Morris the 3rd, does that mean there was 3 of them? The world can only cope with one ! Hi Robert, hope you pick this up. When did GJ backtrack on the statement so clearly recorded and included on the transcript ? Hi Meliti. Watched the Video through your link, but have yet to find it on the official sites. Wonder where it is ? Great conclusion. Jehovah blesses obedience. So if we are not obedient, what happens ? Where are all these fruits of obedience, then ? Great list of scriptures from Olive, also. Look for video on demand , then programs and events, and you’ll see it as a featured video. Wow, WO, those verses gave me goosebumps. Thanks, Wild Olive! Jude directly connecting denying of Christ with Korah’s rebellion is particularly interesting. Compare also Gal 2:4 with the above. A key WT article that made me understand how a veil is being placed over Christ is the March 2016 study version. https://www.jw.org/en/publications/magazines/watchtower-study-march-2016/jehovah-guides-his-people/ See sections 10, 15 and 18. According to the study article, the law of Christ is something of the past. Now, it’s “directions” and obedience to the GB that leads to salvation. Compare also Meleti’s dissection of the same article. Thanks for the link JofA. So, AMIII, this is what you’re saying. We’re not to use that nasty word ‘dogmatic’ because it’s not a nice word when we look it up in the dictionary; it’s negative, and only apostates would be negative and say the GB is dogmatic. But when you give us decrees we’re to hop to it and obey. If we don’t agree, we should pray about it and accept that we’re wrong, and obey. What a load of narcissistic double speak. Appreciate you bringing out some of the unexamined assumptions made in this talk. Unfortunately, toward the end of the clip these same assumptions have led Anthony Morris III to become dogmatic about not being dogmatic! He must not realise that a call to just obey based on the sole assertion of divine guidance is essentially a “mea culpa” about the very thing the Governing Body denies doing. What does this mean? It means that this talk inadvertently disproves that which it attempts to prove – namely, that the Governing Body is not authoritarian. Really, this is a self-refuting piece of spherical nonsense. That is to say, that no matter which way you turn it the talk is contradictory and thus makes no sense. Sheep are natural born followers. In the real world of animal husbandry, no sheep will follow another sheep while in the line of sight of their shepherd or while hearing his distinct call. What the Governing Body have done is to gradually wheedle the sheep away from seeing the shepherd in their midst and have muffled his authentic call with their own bleating. (cf. Joh. 10:3f). By not seeing, the sheep more easily follow those who claim to see and by not hearing they more readily allow others to listen for them (cf. Mat. 13:43). Vox, your assessment is well put. It’s concise and elegant, and nicely gets to the point. Calling the talk “a self-refuting piece of spherical nonsense” is an interesting wording for a “circular argument” that I would not have considered. It occurs to me that the very title of the talk, “Jehovah blesses obedience”, is itself dogmatic. That is, it implies that God himself literally intervenes in the affairs of mankind when they follow his rules. Is that really so? Does the Bible actually make such a claim? While it’s certainly not impossible for such intervention to occur, it does seem like WT (and many other religions) simply assert that an intervention of divine blessing takes place any time anything good happens, but if anything bad happens, God’s role disappears. We are then left with blaming Satan and his followers (as ever-present and ever-reliable troublemakers) as a “test” of our faith and an “opportunity” to show our true motives. Why is it so hard for religious people to believe that some things might just simply happen, and that God (probably) does not manipulate and interfere with every little action they take in life? Especially when He never actually claimed to do such things as a rule? Likewise, why blame Satan for everything that goes wrong? To me, this is an example of what is called “magical thinking”. Religious people often feel a need to believe they are personally involved in a universal struggle of good and evil, and they see miraculous signs and portents in every little detail of their lives. The truth is, they are not that important. The universe does not revolve around them, and miracles are not being summoned up for their entertainment on a daily basis. Reality just doesn’t work that way. We know that because the powerful works performed by Jesus were an extremely motivating attention-getter. That would not have been the case if divine intervention in human affairs had been a common occurrence prior to Jesus’ ministry. It would be fascinating if divine interventions, heavenly blessings and guardian angels ruled our world and controlled our life, but the boring truth of the matter is that we are responsible for the consequences of our own actions, whether for good or bad. That’s reality, and we have to deal with it. Robert, I would present Ezekiel Chapter 28 for starters why to blame Satan for everything that goes wrong with heavy emphasis on Eze 28:13. As for the religious people you mention, they believe what they’ve been taught even though it may be just a careless assumption of what they have heard and been taught to be true without proof, it has become the practice and the custom to read an already false teaching into each particular scripture, taken out of it’s context. In other words to interpret the scriptures to say what they have already been taught and come to believe. You are absolutely correct when you say that we are responsibly for ourselves and actions but so are the angels and everything else in God’s creation that he gave each of us a free will, things seen and things unseen we are all under the force of God weather we are aware of it or not. (Isa. 46:3,4) There’s more to reality than meets the eye or any of our senses. You seem like a very insightful comrade, just keep believing what you know to be true. Few, indeed, ever stop to ask themselves in retrospect how they came to accept the beliefs that have found lodgment in their minds. You’ve made some good points. The idea that God is involved in actualising every event throughout history is known as theological Occasionalism. Of course, this is not the same notion that you presented, but I mention it to show that this position isn’t anything new, and sometimes old views will flow into public consciousness before they ebb away again. As far as I can tell, James highlights that it is right to be thankful to God for the good we receive in general – irrespective of whether he was directly involved in any particular good received (cf. Jam. 1:17). For if God is the ground of all good, then no good can come to anyone – let alone a believer – unless God is good first. As such, we ought to be grateful to God for the means of good, not just for its ends. As far as all adversity being blamed on the Devil, I would agree with you that he often gets too much credit (not that he would necessarily resent the attention). Nevertheless, the Christian is definitely involved in a protracted spiritual battle that the world at large is often oblivious to (Eph. 6:12). This can perhaps be most tangibly seen in the battle for ideas within our present culture, our personal and collective wrestling with moral rectitude and accountability, and the introspective conflict within ourselves when our own carnal desires cry out for satisfaction. Like you, I tend to think that this battle is best understood as a consequence of being captive to a sphere of influence beyond our immediate control, and not the consequences of a puppet-master attempting to hitch his strings. Of course, that is not to say that the enemy isn’t pulling certain strings, only that a world in rebellion can only ever be engineered in such a way that he won’t always have to (cf. Eph. 2:2). Thanks for your comments, Robert. You have a wealth of knowledge and a wide array of experiences that I hope you continue to share with us all. While Jesus was on Earth some 1,986-1,985 years ago only 120 people believed what he said (Acts 1:15). Although he preached his message from God to multiple thousands it is no wonder then that not one of these religions, sects and denominations, except the small and persecuted Church founded by Jesus Christ (A.D.31) believed God’s message. It wasn’t until a little later when the Congregation started to grow. Compare (Acts 2:41). The continuous drumming for obedience (towards GB and its hierarchy, and not Christ) and unwillingness to change doctrines on “two witness rule” and shunning of DAs etc. could speed up authorities’ crack-down on JW, as we have seen in Russia. Can any of you verify the news link below that Russian authorities are preparing for taking away custody of JW children? Paradoxally, such crack-downs (if true, and if it escalates) would make JWs feel that they truly are prosecuted for their belief, and increase staunch support for the org. TPT rocks! Here’s why you should obey: Because I said so…. A perfect example of distorting the meaning of the scriptures to their own benefit. The reason these congregations could grow was that the new joiners (Gentiles) could now become followers because the rules the Jews wanted to impose on them were removed. Acts 16:4,5 make no mention of any blessing. Yes, their faith were strengthened but this was the result of removing the rules the Jews wanted to impose on them. It was the first time I decided to listen to such a video and was surprised to see (or hear) how demotivating the voice of the speaker was. To me it seemed like he does not understand why he has to explain this at all. Just obey, that is what he seems to say. Funny, they call themselves the faithful slave and leave the word discreet out. One can wonder why. Also peculiar. He says in the beginning that the apostles were to solve an issue regarding the food distribution. He then made reference to the event where Jesus fed many people and the apostles were distributing the food. In my view, an event that has nothing to do with the event in Acts 6. Well…. What he conveniently forgets to highlight is that the entire group of disciples were called, i.e. the entire congregation (see Act. 16:2). The entire group could speak. In other words, they complained, were listened to, solution provided and they accepted the solution. Nothing about blindly obeying decrees. Pff. I already regret listening to the video…..
Interestingly, in Acts 6, it was the full congregation that selected the men who were going to distribute the food. The apostles then approved the selection. Almost a democracy 🙂 cf. 3 and 5 below. Wanted to watch the vid myself before reading this. Excellent analysis. Anthony the 3rd looks like he is under some sort of heavy medication. After watching it (took some time to find it) on tv.jwdot.organization. .. I felt sad. Sorry for him. It was like he was kind of trying to reassure himself. Yes DJ, he is in pain. The Laundry Dept. shrunk his pants again….. Thanks Dajo. I use a wordpress plugin that looks up the scriptures. I guess it doesn’t like some of the two-letter abbreviations. I fixed it. By the way, no need to look for the video. I provided a link to it right at the start of the article. See “latest video”. Personally, I like Jim Beam Red Stag. It’s a whiskey with black cherry liqueur. Great on the rocks, real smooth with a nice flavor. I think that is already starting to happen, John. The article there tries to deny a decline is happening by saying the overall membership is still going up, while ignoring that on a country by country basis, it is going down in many of them, and many more have only tiny increases. They also ignore that if you look at cumulative baptism rates vs. membership rates, very large fractions of those baptized each year are offset by losses. Seen from year 2000 until now, they lost about 2 million of the number baptized, and from 1980 it’s about 4 million. That article also tries to “de-myth” the issue of decline by saying, in effect, that WT is ‘qualitatively better’ because it has ‘better’ publication quality and a ‘better’ web site. They call these changes ‘spiritual improvements’ and cite these as evidence of not declining. It is testament to WT-indoctrinated thinking to conflate qualitative changes (even if these were legitimate, a debatable point in itself) with numerical increases. I am afraid that WT and sites like the one noted are going to have a rude awakening, because at the rate things are going, it may only be two or three years before there is a cumulative decline in numbers that they can’t sweep under the rug. I have to assume that is why they are going to stop producing the Yearbook. No need for the R+F to trouble themselves over those pesky statistics at the end. Furthermore, interesting to note that growth rates have stayed subdued (sub 2%, and just slightly above population growth) after JW.org was launched in 2012, which is touted as a great development in preaching work. The hours field service put in per babtism is skyrocketting, and worst of all, over 60% of JW children vanish from the truth (according to Pew research)…. spin that! (1999-2001) Since the “lower class” GB took the helm over from the “elite remnant class” so called Anointed Ones and changed the whole power structure of the Society. (Hostile Corporate Takeover in my view!) And born out of that divorce was the three main new corporations. 1) Christian Congregation of Jehovah’s Witnesses 2) Religious Order of Jehovah’s Witnesses (What? A term some of us mature ones would have been dis-fellowshiped for in our day.) 3) Kingdom Support Services. The uninformed would assume they are part of the Christian Communities of Churches. With over a century of skillfully crafted indoctrination being honed over these past 13 decades this is simply another false flag AM3 is flying for WATCHTOWERAMA! I’m quite sure the person he referred to as giving a prayer is Don Komers who has been at Bethel for many years. He was a CO in the 70’s. Komers is (or was) in charge of purchasing. He was responsible for buying the large globe that was in the Bethel lobby. WOW.Meliti what an expose!Stunningly-plain to see the lack of Holy Spirit,there:his weak Scriptural Base of knowledge;poor-lacking of insights;faulty dogmatic applications(and all in his longtime way of hard, chronically’choppy’& disorganized ramblings,rants and crafty-veerings)..Enough said? 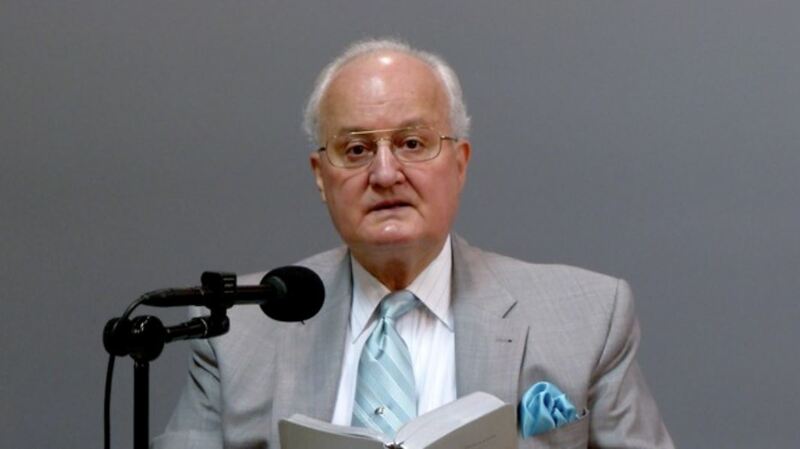 He,along with the other “G.O.D.’s”(“Guardians of Doctrine”,fellow gb member Geoffrey Jackson,in-role, explained to the ARC)fufill:2nd Thessalonians 2:4;Revelation 18:5;Rev.17:4-6;right now I believe we here and faithful others are involved in Rev.18:verses 6,7;and soon… Rev.18:20.The G.O.D. have plainly seated themselves in Christ our Savior’s position=blocking Him. Result?John 5:23,as you Meliti,and precious others here,have so clearly expounded on..Thank You! Just a note on AM3 comment on increase. I saw a YouTube video of a German brother who declares that over the last 3 years 250 congs have been closed in Germany ,which of course would make AM3 comment an outright lie, he wasn’t sure himself , yet his figures seem correct, can anyone confirm that ? There was an article on the German site http://www.bruderinfo-aktuell.de/index.php/die-mehrung-des-volkes-gottes-hinterfragt/ based partly on figures of the official German JW website jehovaszeugen.de. Thanks Mowani, problem is I can’t read German . You can copy most of the article into the Windows clipboard, bring up Google translate, and paste the text into the left panel. Select German as the source language and English for the right panel. Worked for me. You can’t do the ‘tables’ that way but you will get the point of most of it.